Do you find yourself wishing that you too could own a submarine shaped like a dolphin ? If so, then, boy, do I have news for you . If you can track down the guys who created this sucker, then maybe you can convince them to sell it to you for an absurd amount of money (also known as ~$78,000). 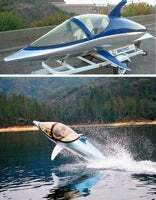 You can cram two people into the Seabreacher, which can submerge 2 feet for up to 20 seconds before popping ten feet into the air. The internal engine has 175 horsepower, though you might as well go whole hog and pick up the super-charged, 300lbs, 240hp engine while you're at it. The 3/4" thick glass on the dolphin boat was cribbed from an F-22 Raptor cockpit, meaning that it can withstand the force of flying head first into the water. Let me ask you: how do you take glass from a fighter jet? Don't we have security on those things? Steering is accomplished with a pair of fins operated by joysticks and a foot pedal-operated rudder. If you fall into the target demographic of "rich adrenaline junkies" or British superspies, then what the hell are you waiting for?